Impress your friends and family with these stunning vegan appetizers! The recipes are perfect for Game Day, Thanksgiving, Christmas, and any other parties around the year. There is something to please everyone! I absolutely love making vegan appetizers! There are sooo many amazing recipes out there. But sometimes it can be a bit overwhelming when you’re scrolling through Pinterest. So I put together an amazing list of my favorite vegan appetizers for you! Let the snacking begin! As always, I teamed up with some fellow food bloggers for this roundup. Just click on the heading above each photo to see the actual recipe. And if you’re looking for even more vegan appetizers, check out my roundup of 30 vegan party recipes I posted last year. So let the party begin!! Vegan Appetizers – 25 Delicious Vegan Snack Recipes For Your Next Party! These vegan summer rolls with mango, mint and peanut dipping sauce make such a great vegan appetizer. I mean just look at those colors! I love making them on hot summer days, but they’re amazing the whole year round! I’ve made them so many times and they’re always a real crowd-pleaser! Maybe you’ve had cauliflower buffalo wings before, but you should really try these buffalo sprouts by Lauren from Rabbit and Wolves. These Brussels sprouts are on fire! They’re super crispy and packed with flavor. These vegan basil ricotta pinwheels with olives and tomatoes are perfect for a quick and healthy lunch. They’re also a real crowd-pleaser at parties and family get-togethers. Sooo good! These baked mac and cheese balls by Sophia from Veggies Don’t Bite are crispy on the outside and full of cheesy sauce on the inside. And the best thing is that they’re made with whole food ingredients and hidden veggies. Yay! Isn’t healthy vegan fast food just the best?! This vegan spinach artichoke dip is one of my all-time favorite dips! It’s so rich and incredibly creamy. Serve it with whole wheat sesame crackers and you’re good to go for your next party! Have you ever tried making fries with avocado? These avocado fries by Caitlin from From My Bowl are oven-baked and oil-free, but still crispy and tasty! Besides, they’re gluten-free and you need only seven ingredients to make them. And of course they’re vegan as well. If you’re looking for a vegan dip for your next party, try this creamy and nut-free vegan onion garlic dip by Melanie from A Virtual Vegan. It’s full of sweet roasted garlic & caramelized onion flavor! Sushi always makes a great appetizer. And sushi without fish? Absolutely no problem! If you are a sushi fan, you will love this easy vegan sushi recipe with avocado, tofu, carrots, and cucumber. Homemade sushi can be so easy! 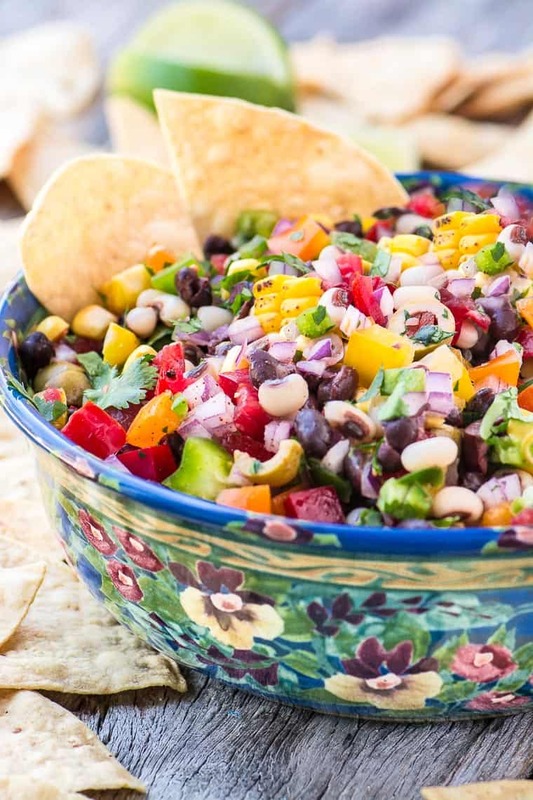 This cowboy caviar by Sue from The View From Great Island is a real multi-tasker. You can serve it a BBQs and potlucks and it has Cinco de Mayo, Memorial Day, and 4th of July written all over it. Get your chips ready for this delicious vegan queso blanco by Sophia from Veggies Don’t Bite. It’s easy to make and loaded with flavor. And of course 100 % vegan! These easy “cheesy” herb stuffed mushrooms by ChihYu from I Heart Umami are packed with fresh parsley, mint, and sun-dried tomatoes. They’re such a great vegan appetizer for parties. If you’re looking for a more exotic vegan appetizer, what about these raw banana ke kebaba by Richa from My Food Story? They’re made with green plantains or raw bananas and are a healthy and nutritious snack. And they’re vegan and gluten-free! 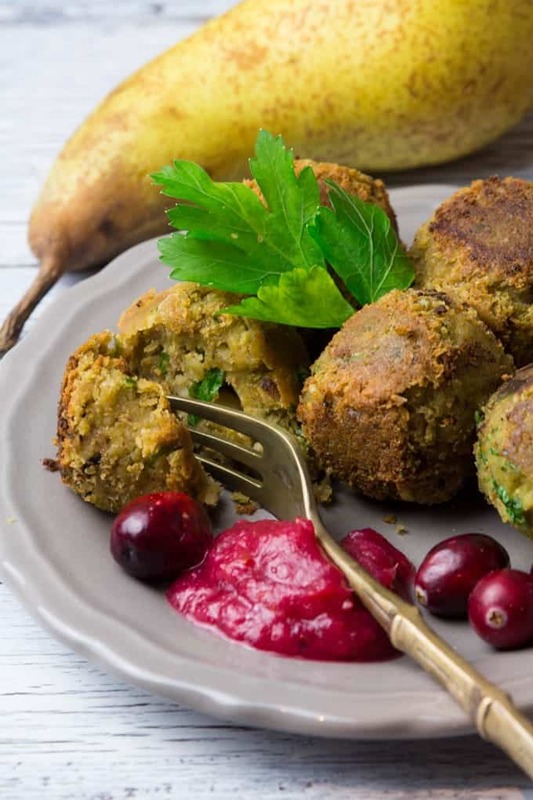 These festive vegan falafel with cranberry pear dip are perfect for Thanksgiving or Christmas! They’re super easy to make and they’re so delicious. And pretty healthy as well! Who knew falafel could be this festive?! This portobello mushroom bruschetta by Florian from Contentedness Cooking are a new spin on classic bruschetta with tomatoes, basil, and garlic. You need only five ingredients and two easy steps to make them. What a great vegan appetizer! And they’re low carb and gluten-free as well. This vegan cheddar cheese by Melissa from Vegan Huggs is a great choice for entertaining or everyday snacking. It’s smoky, sharps, and sliceable. Serve it together with some grapes, olives, and crackers. If you like spicy food, you will love this vegan jalapeño popper dip by Melissa from Vegan Huggs. It’s warm, spicy, and cheese. And also pretty addictive! Besides, it’s very easy to make and it’s ready in less than 30 minutes. And of course we also need more vegan cheese in this roundup of vegan appetizers. This vegetable almond cheese ball Gwen from Delightful Adventures is great for snacking or serving at parties. It looks pretty stunning when it’s covered with fresh herbs like Gwen did. Serve it with crackers, baby carrots, or other veggies. I looooove edamame! They’re the perfect snack – delicious and healthy! And I mean just look at those spicy sambal edamame by Jenn from Peas and Crayons. They’re finger-licking good and ready in under 15 minutes! And what would a roundup of vegan appetizers be without guacamole? You need only 4 ingredients for this tasty guacamole by Kathy from Beyond The Chicken Coop. It is delicious, tasty, and healthy too! Amy from Veggies Save The Day made a vegan version of this traditional Latin American seafood dish that is often served as an appetizer. Amy’s version is vegan, gluten-free, and oil-free. Enjoy it with chips, tortillas, or on its own. This homemade vegan cheese by Alisa from Go Dairy Free is perfect for a cheese platter! Alisa used agar, a type of seaweed that comes in a powdered form and becomes gelatinous when dissolved in water and cooked, to make this cheese. What I love about this recipe is that you can add many flavorings to make this cheese unique. I hope you like these easy vegan appetizers as much as I do. With the holiday season coming up, it’s always good to have a list of vegan party recipes ready. What do you think are the best vegan appetizers? This is a great collection of appetizers! Thanks for including my guacamole recipe! I love party food! I could make a meal out of some of these snacks! Thanks for including my Stuffed Mini Peppers! Everything looks so delicious! I can’t wait to make all of them. YUM!